Each and every year once the New Year is underway those homeowners who have decided they will be selling their home during the spring real estate market should start making some decisions, doing some research, and begin preparing themselves, their families, and their home for the market. This is certainly no exception in the Rochester real estate market and I’m sure the same can be said in your local real estate market. Most real estate markets will start to see a increase in the number of homes for sale as well as number of homes being sold after February 1st. One mistake that homeowners that have decided to sell their home in the spring real estate market commonly make is waiting to get themselves and their home ready to be listed for sale. 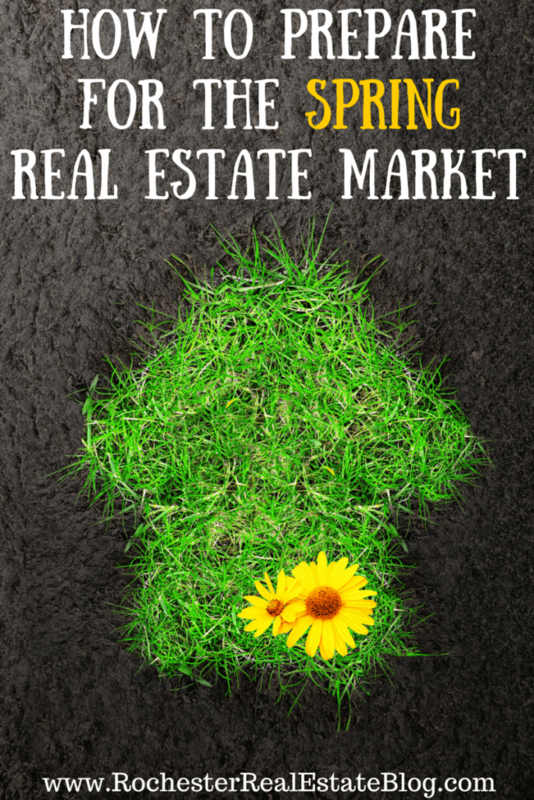 Timing the spring real estate market just right is critical and missing two or three weeks of the prime spring market because they weren’t prepared can cost a homeowner thousands of dollars. Below are some of the most important tips on how to prepare for the spring real estate market. There are tips not only on how to prepare your home but also how to prepare yourself and family. Sellers who follow the tips below on how to prepare for the spring real estate market will have a much more enjoyable and successful home selling experience. One of the most important components of a successful home sale in real estate is correctly hiring a real estate agent. Too many homeowners make the same mistakes made when choosing a real estate to sell their home. Choosing a top real estate agent begins with knowing how to interview prospective Realtors®. Having a top real estate agent can truly make the difference when selling a home in the spring real estate market due to many factors. A top real estate agent will consult with a seller to create a game plan that will lead to a successful and enjoyable home selling experience. Below are three of the many things that a top real estate agent will help a seller work through in order to create a game plan that is acceptable and ultimately will lead to a successful spring real estate market sale. When During The Spring Real Estate Market Should You List Your Home? To the contrary of what many sellers believe, timing the spring real estate market is very important. Listing a home for sale too early or too late can cost a seller thousands of dollars. A top real estate agent will discuss with a homeowner about the current market conditions in order to determine exactly when to list their home for sale. A top real estate agent will analyze statistics from previous years to see when the best time to list a home for sale in a particular neighborhood. While it’s no guarantee that the current year will be the same as previous, by analyzing trends within a particular area from previous years, a top real estate agent can increase the chances that they time listing the home for sale correctly. Sellers who are going to be selling their home in the spring real estate market should expect to hear real estate terms such as market absorption rate and average days on the market from their real estate agent. What Price Will You List Your Home For? Another extremely important part of the game plan that needs to be determined when preparing to sell a home during the spring real estate market is the price a home will be listed for. A top real estate agent will consult with a seller to help determine the price a home should be listed at, in order to initiate a timely sale. Just like there are common mistakes that sellers make when selecting a real estate agent, there are common real estate pricing mistakes that sellers make. If you’ve hired a top real estate agent to sell your home in the spring real estate market and they tell you the price you want to ask is too high, chances are, it’s too high. There are many dangers of overpricing a home and it’s important a seller understands this. If a seller has properly interviewed prospective Realtors® and hired an agent they feel confident in they should trust what their agent is suggesting for a listing price. Will you be moving out of state? Will you be moving into an apartment? Will you buying another home? If so, are you able to purchase a new home without selling your existing home? These are just a few of the many scenarios that a seller may encounter when selling their home. Whether you’re a first time home seller or you’re selling your fifth home, it’s important to understand what the next move is. Having a competent and successful real estate agent who has experience in helping sellers in many different scenarios can make the process seem less stressful.